Here are some of the moments and exchanges between Stephen Harper, Tom Mulcair and Justin Trudeau that resonated most on social media. Viewers might not have expected a debate centred on foreign policy to have as many zingers or viral moments as previous, more wide-ranging debates. Those viewers would be wrong. Many political commentators said they were impressed by the leaders' debate in Toronto, even calling it the best so far this election campaign. Here are some of the moments and exchanges between Stephen Harper, Tom Mulcair and Justin Trudeau that grabbed attention on social media. NDP Leader Tom Mulcair was quick to mention Jack Layton, the late former party leader who led the party to its greatest ever election performance in the 2011. "It is important to remind ourselves that we're in the same room when we said goodbye to Jack Layton to the first time," said Mulcair of the debate venue, Toronto's Roy Thomson Hall. Layton's state funeral was held in the hall just over four years ago. Later, Liberal Leader Justin Trudeau paid a rare tribute to his late father and former prime minister Pierre Trudeau. "I am incredibly proud to be Pierre Elliott Trudeau's son," Trudeau said, after Mulcair compared anti-terror Bill C-51 to the use of the War Measures Act during the 1970 October Crisis by the liberal leader's father. Mulcair also invoked Tommy Douglas, the NDP's first leader. 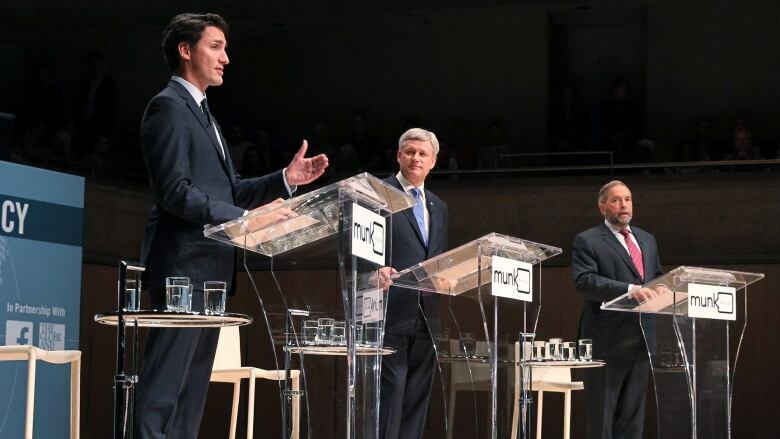 Some commentators noted the confluence of Mulcair and Trudeau mentioning some of their parties' most prominent leaders and figureheads during the debate. Oh god Thomas Mulcair is wedging references to Jack Layton into this question about the fight against the Islamic State. Why. Tommy Douglas reference. Everyone drink. Many people tweeted out metaphorical raised eyebrows when Conservative Leader Stephen Harper defended his government from criticisms about the number of Syrian refugees being admitted to Canadaby stressing the need to help "the most vulnerable people" and "genuine refugees." Some likened it to Harper's use of the term "old-stock Canadians" during The Globe and Mail debate, a choice of words which has been widely criticized online. "Genuine" vs "bogus" refugees is the biggest dodge ever because you get to define which is which *after* you give them medical help or not. Trudeau landed a notable blow against Harper during an exchange on arctic sovereignty and security, though it likely wasn't an off-the-cuff rebuttal. "The one thing they say about you up there, Mr. Harper, is big sled, no dogs," Trudeau said about the government's investments in northern communities and security in the face of Russian expansion in nearby waters. A tweet about dogs (or any other animals, really) is perfect for the Twitter audience, and the hashtag #bigslednodogs was one of the few to rise out of the wider conversation, other than the official #MunkDebate tag. But it's worth noting that seconds after Trudeau made the comment, his official Twitter account posted an image with the quote. One can surmise that it was likely planned ahead of the live exchange. Mulcair has leveled shots at Trudeau during debates in the past — you remember the "puffs of smoke" retort, right? When Trudeau said Mulcair had announced his plan to reduce greenhouse gas emissions with "pomp," Mulcair was quick to jump on it. "I leave the pomp to you, Justin," quipped Mulcair. The crowd loved it. Trudeau waved him off nonchalantly. Speaking of Trudeau waving Mulcair off, it wasn't the first time the Liberal leader chided his opponents, and it didn't end up being the last. Finding herself on the sidelines for yet another major debate, Green Party Leader Elizabeth May took to social media to broadcast her responses to the questions raised at Roy Thomson Hall. She did the same thing during The Globe and Mail's debate, which was focused on the economy. May delivered her positions on such varied topics as the fight against ISIS, Bill C-51 and climate change in short videos on her Twitter account. It was a dense two hours filled with weighty topics such as ISIS, refugees and citizenship, but overall many reacted positively to the Munk leaders' debate. Commentators praised the (mostly) substantive conversation about the topics, and the format that (mostly) minimized the leaders talking over each other. Good job <a href="https://twitter.com/munkdebate">@munkdebate</a> and <a href="https://twitter.com/rudyardg">@rudyardg</a>. Enjoyed that much. I admit I was 100% wrong about this debate. It was very good. The National's At Issue panel called it the best debate of the campaign so far. Some criticized the audience's reactions as being too receptive to the leaders' well-known talking points, however. Solid debate. Horrible audience. Some great moments. Energy definitely flagged at the end but still, better than I expected.